Segel by Yellon – a new landmark in Sollentuna city centre - Yellon - Arkitektur, Design och Kommunikation - Jönköping • Malmö • Stockholm • Berlin. Segel by Yellon – a new landmark in Sollentuna city centre - Yellon - Arkitektur, Design och Kommunikation - Jönköping • Malmö • Stockholm • Berlin. Last spring, Sollentuna municipality announced a competition for the designed area of the former Sollentuna exhibition. The mission was to build a new block of flats with a landmark in the form of a 20-storey residential building. The prestigious competition attracted a large number of agencies and has now been settled. The winning proposal was submitted by Borätt/Seniorgården and has been designed by Yellon. The new neighbourhood consists of about 200 homes divided into nine buildings with individual characters that together create a harmonious whole. The site’s history and context became the starting point for Yellon’s design and conceptualisation of the neighbourhood. In Sollentuna there was earlier a waterway for ships from Lake Saltsjön to Uppsala. Over time, the land rising made the water too shallow to use for sailing and the ships were pulled on logs across the grounds until the next waterway. 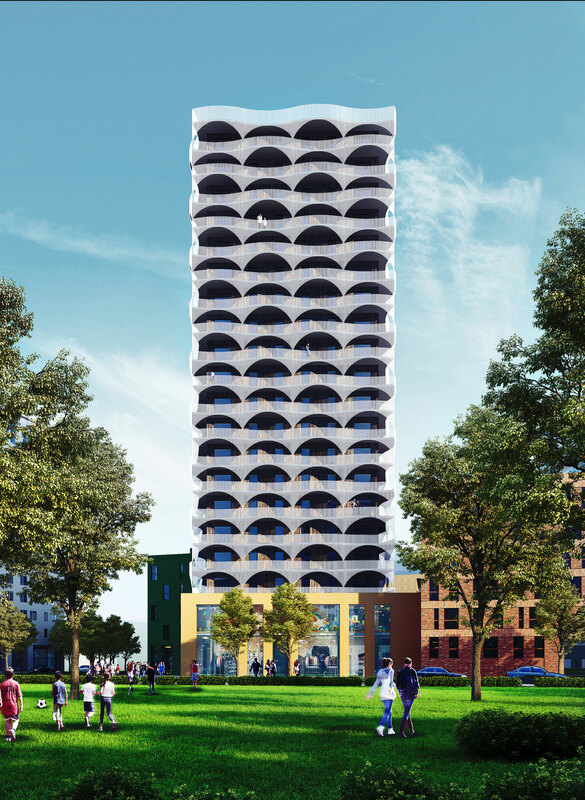 The landmark of the new neighbourhood is a ship-like high-rise building with a log cabin that resembles a wooden ship at the bottom. The house itself is the mast and the rolling transparent arches form the sails. The lower buildings in the neighbourhood symbolise the ship’s precious cargo: a collection of gemstones. Each building has distinctive colours, details and materials resembling different gemstones such as emerald, crystal and sapphire. On two of the roofs of the buildings there are large greenhouses and common areas that invite to activities and gardening. The buildings enclose a lush courtyard that contains everything from an outdoor gym, a barbecue area, a boules pitch and a greenhouse to a yard for the preschool.